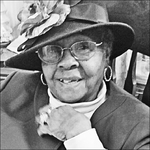 Obituary for Margaret Louise Suggs Pope | McGuire Funeral Service, Inc.
Margaret Louise Suggs Pope was the loving wife of James H. Pope and mother of Crystal F. Brown (Gary), Marlon F. Pope (Kelli) and Rhonda Pope Brown (Kenny). She is also survived by her sisters, Mae Evelyn Suggs, Tina Maxine Bunch and brother, George L. Suggs Sr.; grandchildren, great-grandchildren, nieces, nephews, many other relatives and friends. She was preceded in death by her older sister, Minnie Ruth Smith.